This is part 2 of the inspiration series. See Part 1 here. We are going to do a series of exercises to help you learn to generate ideas. As you become inspired, make a simple sketch. You do not need to have artistic skills to do this. Use simple line drawing. I can promise you from experience that the project is always more beautiful than the sketches. Spend about fifteen minutes on each exercise and do as many drawings as you can before moving on to the next challenge. Try to turn off any critical thoughts, don’t concern yourself with the “knitability” just focus on getting the creative process flowing. Don’t stop at one idea, immediately try to think of another. Just to get you started we’ll discuss one to show you some possible ideas. The prompt is a zigzag. How do you knit a zigzag? Some of the potential ways are as lace, as a knit, purl combination, as colour work, as bobbles and as a shape created through increases and decreases. That’s five different versions, can you think of some more? 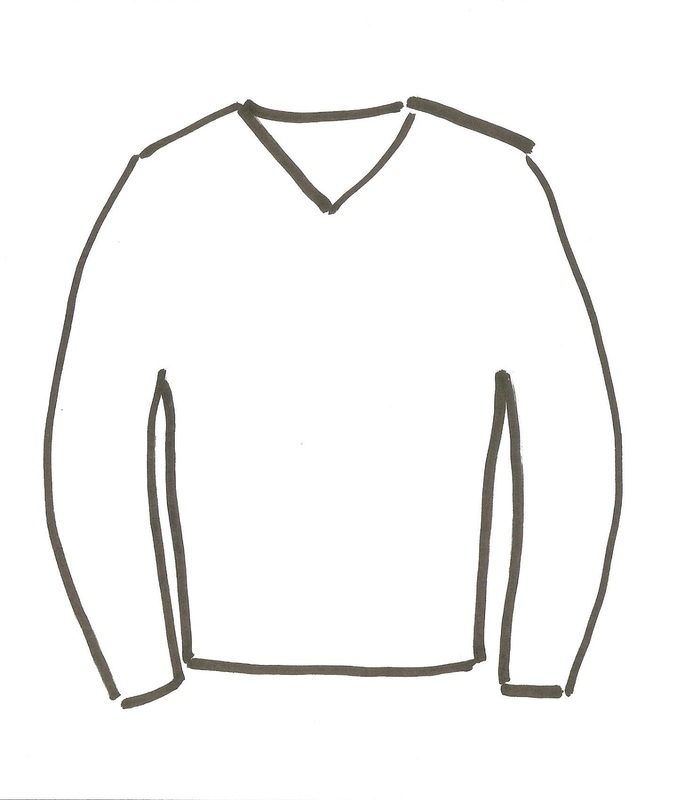 Here's a basic sweater line drawing as an example. Do one like this and cut the drawing out from the centre of a piece of paper, leaving the border intact. 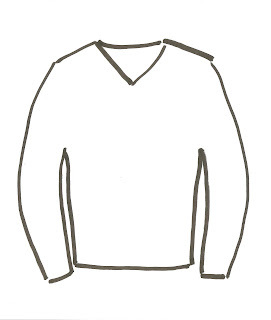 Using your basic sweater shape cut out, flip through books with photos or magazines, laying the cut out over pages and moving it about until you see some potential sweater designs. How would you knit what you see? Set yourself a challenge; knitting lace, working with beads, using mosaic patterns, a limited or large quantity of yarn. Now think of some more challenges and add them to the list. You can work on as many of these as you want or pick one and do as many sketches as you can on that one challenge. Pick an event. It could be a dressy evening outing or a casual lunch with friends. It could be a walk in the park. Now think of more events and list them. Next start sketches of the garments you would wear for each event. Think about what yarns you would choose to work with what colours you would pick and what stitches you would choose. Pick up a ball of yarn. What kind of knitting does the yarn suggest to you? Start asking your self “what if” questions. What if you knit stocking stitch, cables, or lace? What if you combine the yarn with another? Start looking through stitch dictionaries for inspiration. Pick a motif at random and design a sweater. It could be a heart, or a flower or an animal. I want you to play with ideas. Draw a Fair Isle version. Draw one version as an Intarsia garment, do the next one as an Icelandic yoke design. Do one with the motif on the borders only. Now think of some new versions of traditional garments. Pick someone that you know and design a sweater for them. What if you designed theme sweaters for a group, your kids, your choir, and your siblings? You want a design that they would like so think about what colours they wear, what garment shapes would they like, a vest, a cardigan or a pullover. What fiber would you use? What about textures, would the sweater have cables or stocking stitch? Flip through some stitch dictionaries for texture ideas. Repeat any of the above exercises for a different project, a hat, a shawl or a blanket.